HOTELtelecom has been a leading supplier of hotel phone sets since 1989. As such, we will not knowingly be undersold. There's a reason we're among Telematrix's top distributors and you owe it to your business to try us today. 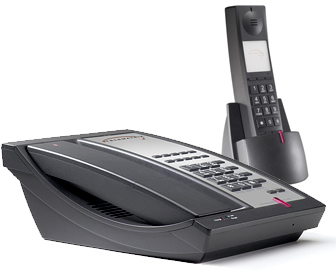 When it comes to selling hotel telephone sets, HOTELtelecom is the best name in the business! 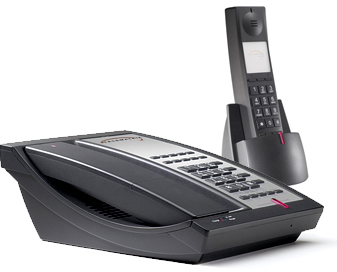 TeleMatrix DECT 6.0 Cordless Phone Series have become America’s favorite cordless hotel room phone through consistently reliable, durable and inventive products. With over 16 years experience and 5 million telephones installed worldwide, TeleMatrix has market proven manufacturing, testing and pre/post service techniques. Constantly looking from the telephone’s eye-view we have pioneered most of today’s hospitality end-point communication innovations. Two-line DECT 6.0 cordless speakerphone with message waiting light and 10 memory buttons. Supports up to 3 additonal handsets. Two-line DECT 6.0 cordless speakerphone with message waiting light and 5 memory buttons. Supports up to 3 additonal handsets. Single-line DECT 6.0 cordless speakerphone with 10 memory buttons and message waiting light. Supports up to 3 additonal handsets. Single-line DECT 6.0 cordless speakerphone with 5 memory buttons and message waiting light. Supports up to 3 additonal handsets.